Branchout is a professional social network app that floats on top of Facebook. These user statistics put BranchOut on a similar growth track to Instagram--the photo-sharing app that Facebook bought last week for $1 billion. According to AppData.com, BranchOut has 13 million monthly unique visitors. These usage trends make it the 31st most popular app on Facebook, ahead of Instagram, Skype, Twitter and Pinterest. BranchOut launched its first mobile app in November 2011. By January 2012, mobile accounted for 25% of the service's traffic. In April 2012, it now accounts for 45% of all visits. Although reaching 25 million registered users looks less impressive when compared to LinkedIn's 150 million, there are 850 million Facebook users for whom joining BranchOut is just a matter of accepting the app's permissions. BranchOut allows users to see which of their Facebook friends (or friends of friends) work at specific companies. Unlike LinkedIn, it doesnt require users to build a professional network one person at a time. Rather, they simply connect to their pre-existing Facebook graphs. The interface works a lot like LinkedIn from there: users can fill in their work histories, send messages to their connections, collect endorsements and request introductions to friends of friends. The 45-employee startup's business model also looks similar to that of LinkedIn. 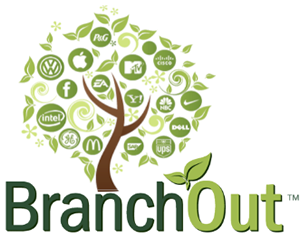 BranchOut hosts about 3 million job listings and has a product for recruiters called RecruiterConnect that works like LinkedIn Recruiter. While building on Facebook is BranchOut's greatest differentiator, it also makes the startup vulnerable to its host's whims. When Facebook changes its features, the team of 45 needs to change BranchOut just as quickly. And if Facebook decides to launch a career feature, BranchOut will likely be toast.